What’s the Featured Game? The Nice List! Have you been good this year? We didn’t think so. However, that doesn’t mean that you can’t have a little fun this Christmas season. Boost your standing with the big guy in red by hanging out with a few of his nicest helpers. 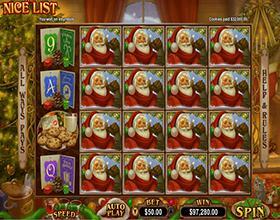 If you’ve ever played The Naughty List video slot, you’re going to love the newest slot from Real Time Gaming. The Nice List is the perfect way to warm up for the winter season with Santa and his gorgeous helpers. Hop aboard the sleigh, and get ready for a very merry experience all winter long! Santa and his helpers aren’t particularly picky, so you’ll have plenty of ways to play and win in The Nice List. Start by loading up the game in either the downloadable or instant play format. When that’s done, click the button to get started, and prepare to make your wager. You’ve probably played games with 25 or 50 paylines, but this slot is unique because it pays in all directions. In total, there are more than 1,000 combinations designed specifically to boost your bankroll. Sometimes it pays to get on Santa’s good side! As with every slot, winning in The Nice List is all about the symbols. Two particularly important symbols to watch for include the Santa grouped wild and the Nice List scatters. Santa symbols pay adjacent from left to right, and Nice Lists pay in any direction. There’s more to the Nice List than simple combinations, though, because collecting three scatters is your ticket to one of the game’s two exciting features. After collecting three Nice List symbols, you’ll randomly trigger either the Santa Spins feature or The Nice List feature. During Santa Spins, you’ll be awarded free games that offer double the prizes of normal spins. If you can land three or more scatters during your bonus spins, you’ll win even more free plays. The Nice List feature lets you pick from 20 presents until you find two naughty notes. These picks could offer free games, doubled winnings, tripled winnings, additional wild symbols or expanding wild symbols. You really can’t go wrong with either feature. Since you’ve been so nice, The Nice List offers a third bonus feature that can be randomly triggered at the end of any normal game. All you’ve got to do is play, and up to 10 free spins with a 10 times multiplier could be coming your way. Remember, all features are played at the bet of the triggering game, so make your wager count on each and every spin. Ho, Ho, Ho! You’ve spent enough time toiling away in the guilty pleasures of The Naughty List. Turn over a new leaf by putting your name on the big guy’s Nice List, and you could be a spin away from a Christmas gift for the ages. Do you hear those sleigh bells jingling? That’s the sound of another big win on the most festive slot of the year!